A heron motif is featured on the West Anglian Way Certificate. 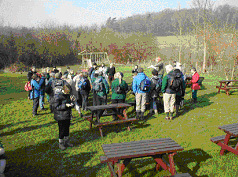 The finale of the six walks from Cambridge to Cheshunt was completed on 22 February, on a day which turned out fine and Spring-like after a misty start. Some 45 people walked from Broxbourne to Cheshunt, via Waltham Abbey, ably led by Mark Westley. During a short lunch-time presentation, in the garden of The Coach & Horses Inn (illustrated left) some 19 walkers received certificates and congratulations for completing the whole 65 mile route. These comprised 9 Cambridgeshire members, 6 East Herts members, 2 from North Herts, and 2 from Royston. Quite a large proportion of the walk was in Essex where relatively few problems were encountered. However, on the penultimate section, walkers needed to bypass a barbed wire fence obstruction to Footpath 78 across North Cannons golf course at Roydon Mead. Complaints have been passed to Essex County Council about this, the only serious obstruction. Thanks to all who helped organise, and all who came on this popular joint Cambridge-East Herts Group event. It is hoped that it will be possible to have The West Anglian Way marked on future Ordnance Survey sheets, and that a leaflet or small booklet will be available in due course. It would be helpful to have feedback on preferred content: an outline leaflet of the route with basic instructions produced cheaply, or a more elaborate booklet with points of interest, illustrations and maps? As a general point, do users keep walking guidebooks they have used as souvenirs of the route(s), maybe annotated with notes, with a possibility of repeating the traverse, or leading others along it? Or when a route is completed, is the rain-stained guidebook passed to a friend or consigned to oblivion in the recycling tray? And how many of the folk present are “addicted” to long distance paths, and veterans of The Icknield Way, The South Downs Way etc? Was there anyone for whom this was their first long distance route? 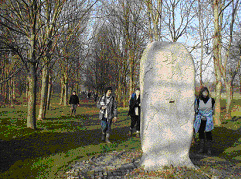 The Meridian Stone near Waltham Abbey. Great & Little Chishill, South Cambridgeshire. Scenically, geographically, and historically, this parish is amongst the most notable in South Cambridgeshire District, and well worth a prolonged visit. The parishes of Great & Little Chishill were amalgamated into one in 1967, and together cover 1300 hectares, lying across a steep chalk escarpment, rising from 40m at the A505, to a high point of 146m. The open village fields were enclosed in 1818. In Domesday Book, the name is given as Chishelle, meaning “gravel hill”, and referring to patches of gravel overlying the chalk in higher places. The parish was part of Essex until 1895, when together with Heydon, it was transferred to Cambridgeshire. *(2) The Icknield Way (IW) routes passing through the parish were already important in the Neolithic and Bronze ages, with at least 40 ring-ditches known from the air. The IW continued in use as a long distance path (LDP) in the Middle Ages, and strip lynchets survive from medieval ploughing on Chishill Down, TL 423 400. Contemporary use still takes the Icknield Way LDP through Chishill on the old trackway. Great Chishill’s C15th church (with a modern tower) stands on a prominent mound at the village cross-roads. Little Chishill Church stands beside what is now only a hamlet, and is best reached on foot from Great Chishill via the byway running S from May Street at TL 420 384. After cresting the hill, the track becomes a sunken lane, descending past the gardens of Little Chishill Manor, to emerge on the Little Chishill road at TL 419 374, almost opposite the church. A public footpath crosses Little Chishill churchyard and exits between trees over a stile in the rear fence. The right of way crosses a grass field to a stile in a crossing fence, and continues W, across an arable field to a wooden bridge at the county boundary spanning “Water Lane”. A continuing path leads to Shaftenoe End, Herts, whence a return may be made to Chishill via the minor road. (3.5 miles). 146m (480ft) is situated near the county boundary at Great Chishill at TL 427 380, about 400m S of the B1039, where a grassy triangle marks the driveway leading to The Hall (rather hidden in trees). From here, a bridleway runs across the arable field towards Building End. Continuing, a good 11 mile walk (*3) can be had via tracks and paths to Langley Church, Duddenhoe End, Chiswick Hall, the isolated Chrishall Church, Chrishall village, and along the line of the Icknield Way Long Distance Path back to Chishill village. Parking for this walk, however, is better in the village itself, where there is a small car park near the telephone box, TL 423 388, close to The Pheasant Inn. Also of interest is the attractive preserved postmill, sited at TL 413 388 outside the village on the B1039 towards Barley. This mill, which last worked in 1951, was rebuilt in 1819, using timbers from an earlier mill of 1726. The modern restoration has left the sails without shutters and a rather odd skeleton of a fan has been provided. The mill is, however, complete internally, having 2 pairs of stones, and all-wood gearing except for a cast-iron windshaft (*4). Keys may be obtained from houses in the village. The mill is maintained by Cambs.C.C., who provide a display board, a small car-park and picnic area. A well-maintained public footpath leads from behind the adjacent garden towards Chishill village centre. At the crossroads stands the village sign illustrating the mill. Leave the village cross-roads NE, and shortly turn NW down New Road. At TL 423 392, a green metal sign in the hedge indicates a track between gardens, then round a field edge to enter the old parish clunch pit, which is maintained as a nature reserve. The public footpath through the pit runs generally NE, as a narrow earth track between rampant vegetation to emerge on another footpath at a T-junction, TL 425 393. From here, turn right (uphill) on a narrow path between a stream and hedge, to return to the village. This footpath exits at TL 426 391 onto Heydon Road, Great Chishill, a short walk from the crossroads. Alternatively, for a longer walk of 4 miles, turn left (downhill). The path at first is a narrow defile, with the trees of the former clunch pit to left, and a stream to right. Soon, the path opens to fields on the left, with wide views over the Cam Valley. It continues to New Buildings Farm, then still NW to join the ancient Icknield Way track, by a signpost at TL 410 418. Turn right along this green lane, between intermittent hedges. The byway along the line of the ancient Icknield Way trackway continues in the parish of Heydon, reaching a marker post at TL 412 420, near a copse. Turn right uphill, now following the line of the Heydon Ditch (an early Anglo-Saxon fortification). At first this is a raised grassy baulk between arable fields. As it climbs the hill, it becomes a hedged path, later between high banks, and finally emerges between gardens by a footpath signpost with Icknield Way markers on Fowlmere Road, Heydon, at TL 431 405. Walk S up the footway towards Heydon Church (bombed in 1940, observe the brick restoration) then turn right along the road, passing the King William IV Inn, and the Wood Green Animal Shelter.The former provides food, and visitors & donations are welcome at the latter! * (1) Archaeology of Cambridgeshire. Vol.1 South West Cambridgeshire by Alison Taylor. Publ. Cambs.C.C.1997, pp.29 – 30. * (2) An Atlas of Cambridgeshire and Huntingdonshire History. Ed. T.Kirby, S. Oosthuizen, Publ.Anglia Polytechnic Univ. 2000. * (3)Full description – walks in South Cambridgeshire, 2nd. Ed. 1993.Walk 13. Publ. Cambridge RA Group. * (4)Batsford Guide to the Industrial Archaeology of East Anglia, by D.Alderton & J.Booker, 1980, pp. 43 -44. The following information is extracted from Cambs.C.C. Annual Report of Changes to the Definitive Map, as made by Legal Order in the year 1 April 2001 to 31 March 2002. Some of the new paths have been available on the ground for some time already. Because of Ordnance Survey copyright restrictions, we are not able to reproduce any maps here, but the following grid references will allow readers to annotate their maps. A section of Fp 41 has been upgraded to Br 59, & a section of Fp 48 upgraded to Br 60. The bridleways were created by agreement with landowners, Sustrans Ltd., and by upgrading 2 sections of footpath, total length ca. 650m, forming part of a National Cycle Route. Part of footpath 10 between Camargue Drive and Cavalry Park was extinguished as part of housing development. Grid refs TL 417 955 to TL 417 956. A path was created alongside the M11, near its junction with the Barton Road, A603, opposite Haggis Farm. Grid refs TL 417 562 to TL 420 561. The footpath was created by Cambs.C.C, by agreement with landowners. Walkers on the Icknield Way were subject to a long detour for some weeks until after Christmas when the bridle bridge was closed over the M11 at TL 502 422, on the long path from Strethall Field to Great Chesterford. The editor can confirm that the bridge and path are now reopened. The bridge now has new high-level shuttering, designed to shield horses from the distracting view of the traffic on the M11. This long path runs from Caxton End at TL 317 576 to Broad Way at Great Common Farm, TL 335 593. As anyone familiar with the locality can imagine, this once pleasant footpath has become entangled with the eastern edge of Cambourne. Eventually, part of the path will run through a landscaped area and past a lake, then along what we hope will be a green corridor between further housing development. At present “brown” would be a better description than “green”(! ), and the developers have proceded to dig out the lake, and block the route before seeking a formal diversion, or even consulting with user groups. A temporary diversion is now in place, only after a local user found “path closed” notices. This narrow bridleway, running east from the road at Highfields, TL 351 582, to join Bridleway 4 alongside Hardwick Wood, has for many years been almost unusable by walkers in Winter’s deep mud. The fenced path is defined as a mere 10 ft wide, and in practice is usually less, due to the adjacent hedge. Karen Champion, with Cambs C.C’s Countryside Services Team, reports that work on improving this route has recently been completed. The footpath following Caudle Ditch along the Teversham parish boundary to join Little Wilbraham River at TL 518 589 has long been subject to bushy overgrowth. But Karen Champion of Cambs.C.C. now reports work by 40 servicemen from Waterbeach base have now cleared this valuable and attractive route. Last issue’s sad story about cracked up boots must have struck a chord, and I have received several tales of boots that, for one reason or another, failed to make the grade. The news-sheet of the Cambridge Rambling Club from time-to-time has sad little adverts “For Sale, …boots as new, only worn once“. Has the seller been obliged to give up serious walking? Did they prove too large or too small? Or were they too ferocious to be broken in? I have been taken aside at a meeting, and shown a pair of heavy-duty boots, worn only on four mountain holidays, with a large slit in the leather at one side, and effectively useless. Well, let us hope that Santa, or at least the January Sales will come up with perfect footware for all our readers. The West Anglian Way – off to a good start! On the 3 November, 40 ramblers left Cambridge station, on the first leg of their route to Cheshunt. Walkers came from the Cambridge area, and from all over Hertfordshire, 4 from London, including one lady here for a few months from Australia. Kate Day, Cambs C.C.Countryside Access Team Leader, accompanied by her little son, Benjamin, had sent us on our way with welcome words of encouragement and support. The early mist on Sat. 16 November did not delay the trains, so 42 ramblers were able to set off promptly at 10 am from Whittlesford Station, under the expert guidance of Gwen and Lawrence Gerhardt. Crossing the A505 was fortunately fairly easy, due to roadworks, and in future a central refuge here should ease the problem. We walked south through Duxford, passing the redundant church of St Johns, the charming village green, and the church of St. Peters. We continued down the road past the new housing and the chemical works, and over the level crossing and the footbridge over the ford. The deep water here ensures that little traffic ventures, making this a quiet lane for pedestrians. In Hinxton, we turned off through the grounds of Hinxton Mill (owned by Cambridge Preservation Society, the mill being open to the public on some Summer Sundays). A worn grass path led by the swollen river Cam, and then alongside the railway, where Gwen & Lawrence had put in work to clear the path of branches brought down by the October storm debris. Field paths took us to Butchers Lane, Hinxton, and down a passage where we had to scramble over the debris of a fallen flint wall. Some of the party took coffee break on the ample seats of the recreation ground, while others repaired to the welcoming Ickleton Lion. We continued along Back Lane, and turned into the quiet Coploe Road, which climbs steeply uphill, crossing the M11, and passing a local nature reserve, bright with chalkland flowers in Summer, but bleak now. As we climbed the hill, gleams of sunshine came through the clearing mist, giving atmospheric views of the high land ahead. The party had left Cambridgeshire for the last time on this walk, and from now on would, for many miles be in Essex’s Uttlesford District. A picnic lunch was taken in the graveyard of the isolated St Mary’s Church, Strethall. We pressed on swiftly, field paths taking us past St Ann’s Wood, to emerge from a muddy bridleway into Littlebury Green. Here we crossed the village street straight over onto further good paths leading us over the M11, and down into Wendens Ambo, where there was a brief pause to admire the old church of St Mary the Virgin, with its fine Norman doorway. Over the recreation ground, we took the lane route to Norton End (avoiding the field path with regular Winter flooding), and took a concrete bridleway south over the hill towards Whiteditch Lane, Newport. Conversation flagged as we made this steep climb late in the walk! We made a final uphill across the recreation ground to St Mary’s Church, and at last along Newport High Street, admiring the many splendid old buildings, several of which were once coaching inns. The station was reached by 3.30 pm, not bad going for a longish walk. All the future sections are shorter! The third section of the West Anglian Way will be led by your editor on Saturday 30 November, when walkers will leave Newport Station at 10 am, for a 10 mile walk to Bishops Stortford. Morning coffee break will be held at Rickling Green, and a lunchbreak will be taken at Stansted Mountfichet, where there are several pubs and eating places, and the opportunity for those wanting a shorter walk to leave us at Stansted station. Note that this is the last of the walks in the series before Christmas. The fourth section of the Way starts from Bishops Stortford Station on Sat.18 January 2003, starting at 9.40 am from the station forecourt. Walkers from Cambridge note the earlier train leaving at 9.05. This is the now traditional bun walk. For the uninitiated, participants on one Cambridge Group walk every January are offered a cake or bun as a festive season gesture and to help sustain them against the winter chill! Do all come along for a 10 mile largely riverside walk to Harlow, and work off all that Christmas sloth. We look forward to the Fifth Section of the walk, Harlow to Broxbourne, on Saturday 8 February, and the final section to Cheshunt Station, via Waltham Abbey, on Saturday 22 February. Both of these walks will be expertly led by Mark Westley on his home territory. There will be certificates for those who have completed all the walks. It came as a surprise, on a visit to the Isle of Man a few years ago, to discover that not only did a coastal path exist, but that it extended to 96 miles – an ideal length for a week’s walking. I returned to the Island in May to tackle the Coastal Path Challenge, as the Raad ny Foillon (path of the seagull) was described by Legs of Man, the company who organised my trip. Right from the start, variety was the watchword. The bustling town of Douglas was soon left behind. Marine Drive, a Victorian-built road now closed to traffic, provided an easy level walk for the first few miles, overlooking splendid rock scenery. A mixture of road, field and coastal path led to Castletown, passing Ronaldsway Airport, scene of a battle between Scots and Irish in 1275. The second day featured the Chasms, a rocky area with fissures dropping down 200ft to the sea below, and the Calf of Man, a tiny picturesque island used as a bird sanctuary, finishing at Port Erin after passing literally within inches of nesting seagulls. The route to Peel involved about 4500 feet of climbing, with three dramatic moorland mountains to scale, but proved less strenuous than I expected. By contrast, two days with some long stretches of level sandy beach walking were surprisingly tiring. The final two stretches featured too much road walking, even if we did pass Norman Wisdom’s house, but fine views of a couple of ancient churches were a compensation. On the last day, a ceremonial tape stretched across Douglas promenade completed the walk, and the Island’s Director of Tourism appeared in person to present us with our certificates over a glass of champagne! *Out of Date* For up-to-date info see link. The Ramblers’ Association Cambridge Group offers a selection of reasonably priced walking guides, all available at £4.50 by post from Bernard Hawes, 52 Maids Causeway, Cambridge, CB5 8DD. Cheques should be made payable to “Cambridge Group of the Ramblers’ Association“. All have sketch maps and drawings, route descriptions, and points of interest. And look at the number of walks you get for your money! Compare these with commercially published guidebooks, typically having only 10 or 12 walks. 23 walks from 4 to 20 miles, covering Cambridge, and many of the villages to the west, south and east. This is the Group’s classic best seller, first published 1987, with regular revisions and new editions since. 30 walks from 1.5 to 17 miles, covering the fens near Littleport, Ely, Wicken and Soham, and the horse-stud belt around Newmarket. 28 walks, most with longer or shorter options, giving routes from 4 to 18 miles. This is the book for readers wishing to venture outside the immediate Cambridge area, as the walks spread over the borders of Bedfordshire, Suffolk, Essex and Hertfordshire. Formerly marketed by The Fen Rivers Way Association, this popular guide is now in its third edition, covering the Fen Rivers Way, a linear walk from Cambridge to Kings Lynn and beyond, together with a dozen circular walks based on the Cam & Great Ouse. The Bramble – Friend or Foe? The season for blackberrying is past, and only the last, dark, moist remnants now hang at the ends of leafless trailing brambles, threatening to trip the unwary path user. But who has not enjoyed the September hedgerow harvest straight from the plant in passing, or gathered into the post-prandial lunch box? Or how many have not set out more purposefully to gather the fruit in pound or kilogramme amounts for blackberry-and-apple pie, crumble, jams, jellies, or for the freezer? The fruit is very rich in vitamin C. It is possible to make good jam or pip-free jellies using blackberry alone, but a firm set is more easily obtained especially in jellies, by adding strained juices of apple or crab apple. The bramble, Rubus fruticosus is botanically of the rose family, and is not a single species, but rather a group of up to 400 subspecies, or microspecies, as found in Britain and mainland Europe. Differences between the subspecies depend on factors such as habit (erect or creeping); type, size and colour of prickles; leaf form, colour and hairiness; flower (colour and size); and fruit (number of drupelets). Keeble-Martin, and O.Polunin whose volumes provided this information do not, unfortunately correlate the information with which main subspecies give the pleasantest fruit to eat! In my opinion, however, the average wild berry has a superiour flavour to the cultivated types, although it is generally only about a third of the size. It is worth being aware that there is a separate species, the dewberry, Rubus caesius, which is similar to the blackberry in appearance, but is not good to eat (although not poisonous). The fruits of this plant have large, grey-bloomed drupelets, which tend to ripen earlier in the year than the blackberry. Now to consider the Jekyl & Hyde character of the common bramble. The trouble arises when this fast-growing character lurks beside a footpath in a confined space. Walking beside a bramble hedge is unwise in one’s newest Goretex jacket, as the breathability is likely to be enhanced! From a tall hedge, trailers hang down to snag the hair or the woolly hat, or the creeping, low-growing variety send out long low shoots to trip the unwary. From the plant’s viewpoint, this is a useful means of propagation, as the end of the shoot can root elsewhere in the ground, to form a new plant in the middle of the path. In the space of a year or two, the path, if not kept trimmed, can become a solid mass of impenetrable bramble, often interspersed with its friend the common stinging nettle. Following last year’s Foot & Mouth epidemic, and consequent path restrictions and neglect, we have become very aware of the power of the bramble. From the B1061 at Slugs Green, near the water-tower, south of Dullingham, an attractive path runs west to Underwood Hall, Westley Waterless. The earlier sections of this path run beside a ditch to right, and are closely fenced to left. Until this was cleared, the brambles, growing exuberantly in the adjacent ditch completely choked the path. Recently we walked in Castle Camps, and visited Great Bendysh Wood, emerging on the road near Olmstead Green. A newly signed and waymarked footpath runs through the grounds of “Meadowside”. As the route exits over a splendid new County Council bridge to give access to the field beyond, we found our way over the bridge totally blocked by brambles, that had encroached from the side, and insinuated their way between the wooden boards. Without secateurs (and a spare half-hour) we would not have won through! This had occurred in a mere 18 months. The only advice I can offer is to carry secateurs as routine, and to report serious encroachments to the County Council – sometimes action is taken before the path is totally blocked! But I still like blackberry jam! Come and join Cambridge RA, Royston RA, and East Herts Footpath Society along a new Long Distance path, The West Anglian Way, from Cambridge to Cheshunt. It is accessible throughout by railway, and is named after West Anglian Great Northern, and takes its symbol, the heron, from that of the railway. However, for copyright reasons, note that our heron looks different! Train timetables are always liable to alteration: please check nearer the date. There are pubs on the routes of all stages, but we advise people to bring some food. Leaders on walks 1 – 4 are Roger, Janet, Gwen & Lawrence. The leader for walks 5, 6 is Mark. Start from Cambridge Station forecourt at 09.40. Lunch at Stapleford. Train from Bishops Stortford arrives Cambridge at 09.37; train from Stevenage at 09.25. Return trains to Cambridge from Whittlesford at 21 & 57 mins., from Shelford at 01 minutes past each hour; to Bishops Stortford from Whittlesford at 12 & 43 mins., from Shelford at 39 mins. past each hour. 3. Sat. 30 November 2002, Newport to Bishops Stortford (11 miles) or half-day to Stansted (7 miles)Catch 09.34 train from Cambridge, arriving Newport 09.56, or meet at Newport station (village side) 10.00. Lunch at Stansted. Train from Bishops Stortford arrives Newport 09.44. Return trains to Cambridge from Stortford at 01 & 31 mins. past each hour, from Stansted at 35 mins. past each hour; to Stortford from Stansted at 7 & 35 mins. past each hour. 4. Sat 18 January 2003, Bishops Stortford station to Harlow Town station, 10 miles. Return trains to Cambridge from Harlow at 21 and 49 mins past each hour. 5. Sat.8 February 2003, Harlow Town station to Broxbourne station, 10/11 miles. We hope to have certificates for finishers! Kilnhill, Bassenthwaite,Cumbria 7 – 14 May 2003. New readers of Cantab may not be aware that a small group from Cambridge have made an annual pilgrimage to the Lake District for the last 5 years or so. Once again, we plan to stay at Kilnhill with Ken and Heather Armstrong for a week, (Wed – Wed, leaving Thurs morning). As previously, we shall aim to do about 9 – 12 miles a day, with a mountain climb if the weather makes this possible. We may or may not know the particular route, but we do have a good range of maps & guidebooks, and we have visited the Lake District many times in the last 40 years. We do not deliberately aim for screes, or places with high exposure, but bear in mind that the terrain is often rough & steep. The Lake District is just like that! We will not do the same walks as previous years, but those who have come on all the holidays may find they are occasionally crossing the tracks of previous routes. We may drive a little further afield in 2003! We will use OS Outdoor Leisure Series NE & NW Cumbria (yellow covers). You might also like to have OS Landranger Sheet 98, West Cumbria., showing the guest house Grid Ref. 214 326 at the N end of Bassenthwaite Lake. A metal walking pole (or two?) is highly recommended, and waterproof overtrousers are essential. Kiln Hill Barn, Bassenthwaite is a good centre for the Northern Lakes. In the house there are now 5 double or twin rooms, and 2 singles. In the annex there is one double and 1 twin. Rates at 2001 were £235 per week bb/em. Parking is in a clean, cobbled yard. The accommodation is good quality, with some rooms en-suite, all with central heating, and tea-making facilities.There is a hall pay-phone & TV lounge. The food is varied, generous in quantity, and very good. The Armstrongs have re-arranged the accommodation, and this year, all meals are in the house. Transport – By car, using M6 to Penrith, then A66 Keswick bypass and A591 to Kiln Hill Barn. It is possible to arrive by public transport. Interested? Then please make your own booking: Ken & Heather Armstrong, Kiln Hill Barn, Bassenthwaite, Keswick, Cumbria, CA12 4RG. Tel. 017687 76454…. Please let me know you have done so! Cracked across at 14 months – or the sad tale of a pair of boots. . . Readers will know (or at least guess) that your Editor does a lot of walking, something like 50 miles per week in her walking boots. For the sake of both feet and boots, I try to wear a couple of pairs alternate days, so a single pair of my boots might do 1250 miles in a year. Normally, my boots last about 3 years under these conditions, and are treated with boot wax and the usual tender loving care. Thus, I was not pleased when a pair of ladies’ Scarpa top-of-the-range size 39s cracked above the toes after just 14 months, although the soles were in good order. I returned them to “Open Air”, who were also concerned, and passed them back to the manufacturer. I was distinctly annoyed when they came back with the comment that I had allowed the leather to dry out. I have cared for boots for some 40 years, and if other types mostly make the 3000 mile plus mark under my treatment, then so should Scarpa. My latest are a pair of substantial Meindl, costing a bit short of £100. I’ll let you know if they are still going strong in 3 years’ time! We recently had the pleasure of joining Essex Ramblers’ Association in their annual Essex 100 mile walk, 3 – 11 Aug.. The original idea was the brainchild of Fred Matthews, and we were delighted to see Essex’s grand old man of rambling riding in the support car most days. The route is different every year, and is a way of gathering groups from all over Essex, and of encouraging Essex County Council to put in new bridges, signs, etc, and to remove a few obstructions along the way. Each walker is given a free prospectus of the route, complete with points of interest passed each day. This year, the start was in Cambridgeshire, at Castle Camps. The official opening was performed by Mrs Wendy Silby, Chairman of Cambs. C.C., and the day’s walk was accompanied by Karen Champion, the County Council Footpaths Officer covering South Cambridgeshire District. Jack Rixon and Alan Hardy represented Castle Camps, and Roger Lemon and his wife came from Shudy Camps. There were 55 people on the first day, and we left Cambridgeshire in the late morning sun, to make it over the county border and via the Bumpsteads to Hempstead (12 miles), where we had left the cars in a large farmyard, and from whence a coach had taken us to the start of the day’s walk. Sun 4 Aug started cloudy, and rain commenced steadily at lunchtime. The walk took 48 people a further 12 miles from Hempstead via Radwinter and Wimbish, and a devious route to Thaxted. Here, as in subsequent places, the local councillor who opened the day’s walk spoke of the local opposition to the governments proposals to add a further three runways to Stansted airport. This would swallow-up large sections of Uttlesford, as far south as the Eastons We were encouraged to write to our MPs. On Mon 5 Aug, the route took us from Thaxted to Wethersfield, via Great & Little Bardfield, and Finchingfield. (12 miles) These are all “picture book” villages, but there were heavy downpours all day, and I mostly recall tramping along sodden green lanes under waterproof & umbrella, looking at the sea of umbrellas in front. The best dressed Essex ramblers in summer rain wear boots with gaiters, shorts covered by Malden & District black dustbin bags, RA or other T-shirt and large umbrella. On the way home, it was a lovely afternoon, and Roger & I stopped at Finchingfield, just in time to have a splendid cream tea before the thatched tea-shop closed at 5.30. Tues 6 Aug was a slightly shorter day, (11 miles), in delightful quiet countryside from Wethersfield to Stebbing, via Great Saling and Bardfield Saling (with its unusual round-towered church).It was a fine day, but numbers had shrunk to 38, probably due to the conditions on the day before. On Wed 7 Aug, the 12 mile route took us round some very attractive parts of Dunmow, and by the River Chelmer. At one point, we all had to cross the A120. Four people had yellow tabards. We were lined up at the end of the path, and drilled. Two yellow tabards at the front (one an ex-policemen) advanced into the continuous stream of traffic and put up their hands. And everything stopped (slight groaning of brakes from lorries down the queue), and we all went across, with some good-tempered waves from motorists. In 1 km, we had to cross the workings for the new A120, (where there is to be a pedestrian bridge). The leader had obtained a permit, and a road-engineer was detailed to see us across the mud-with-puddles. (We don’t know if they feared we would slip or drown in the mud, or hijack a JCB!). The pleasant engineer took a photo of the lot of us, and said we should do this every week to justify the cost of the footbridge. We were all thinking “what a satisfactory day” when it started to rain, insidious light rain at first around 3 pm, becoming heavier… The last sections were across arable fields, 2 recently cultivated, then through a potato field! Thu 8 Aug, was an easy and delightful day of 11 miles. The route was less convoluted than some of the earlier days, and took us in almost a straight line from High Roding via Pleshey to Broomfield, all on pleasant paths or lanes. The day was almost dry, with just 3 micro-showers. Fri 9 Aug. From Broomfield, the walking route took us East of an old airfield, and past an enormous gravel pit – past woodlands and over the A12 on an accommodation bridge to Hatfield Peveril. By then, the 42 people were in their usual state of wetness. It continued raining through the grey afternoon to Wickham Bishops (11 miles). On Sat 10 Aug, with permission we all parked at the jam factory at Tiptree. The morning started dry but very humid, and soon there were rumbles of thunder. By 11 am, 38 people advanced unsteadily across slippery flooded stubble in a thunderstorm, as the rain sluiced down. The day was black, and there was a low moaning between the thunder claps. Later we learnt that we had been half a mile away from a mini-tornado! The pub at Little Totham was very tolerant of all these wet people, eating their own sandwiches inside, and leaving mud and water where they made contact! After lunch the sun came out, and we all steamed, and made it back to Tiptree in good spirits, in spite of an unforeseen detour, adding a mile to the route (13 miles). We had an excellent tea at the factory, and set off back home, via Braintree as far as Sible Hedingham, only to find the car was diverted back to Braintree by floods. Sun 11 Aug. The last day was blessedly only 7 miles to Layer Breton, near the Blackwater Estuary, passing the lovely Layer Marney Towers. The event finished at lunchtime with a barbeque. Some 31 people got their certificates from the Mayor of Colchester, Nigel Chapman, and each walker was given a friendly send-off by the RA Essex Area Chairman, Colin Jacobs. Congratulations to Essex RA Area on a very well-organised event, which was most enjoyable, in spite of the weather. We met several old friends and made some new ones. We would encourage other people to join another year. 2003’s event will be in May, from Long Melford to Chingford, near Epping Forest. To walk to Fen Ditton over Stourbridge Common, it has been necessary to go “inland” and cross the railway line by the footbridge with many steps – difficult for some, and impossible for bikes, prams and wheelchairs. This is a confusing and unattractive start to the Fen Rivers Way. One often meets walkers puzzling over the sign board at the end of Riverside. Recently a board walk has been constructed under the river railway bridge which makes a much pleasanter walk to Fen Ditton and a good cycle commuting route for those living in that area. It is also possible to have a short circular walk around Stourbridge Common using the new boardwalk and the old railway bridge. Sadly, however, on a recent visit, it was noticed that access to the railway bridge is becoming difficult because of overgrowth through lack of use. It is hoped that there are no plans to dismantle the bridge. Cantab usually appears every two months. Those of you who receive Cantab by e-mail will generally receive it in a compressed “Winzip” form. If you would prefer to have it uncompressed, then please let us know. If you would like to receive an issue by post, a large SAE would be appreciated! Any comments on content, and offers of brief articles will be gratefully received.